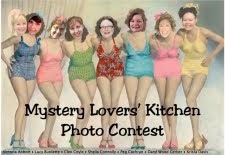 LESLIE: Today, we're starting something new in the Mystery Lovers' Kitchen. 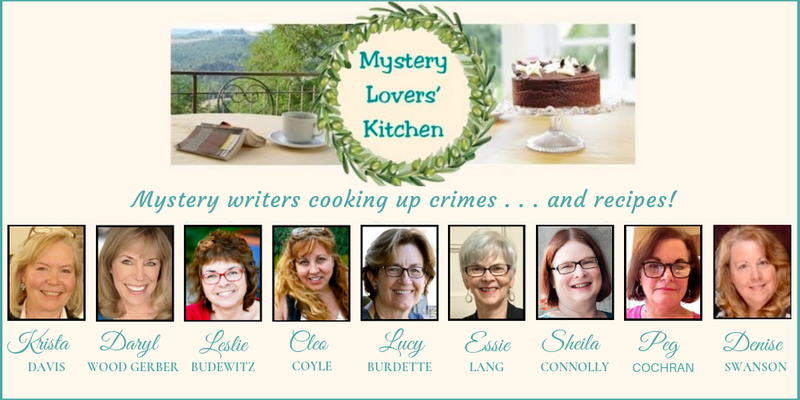 On the first Monday of the month, we’ll gather around the Kitchen table to chat about something on our minds—food-related, because we’re all obsessed with cooking up recipes as well as crime! Today, we’re remembering our early cookbooks. We hope you’ll join the conversation in the comments. As a teenager, I worked at Waldenbooks, and on September 8, 1978—I dated the bookplate—I used my employee discount on The Vegetarian Epicure, Book Two. The author, Anna Thomas, traveled widely in Europe and beyond, then created vegetarian versions of favorite dishes. Opened up my little palate, I’ll guarantee you! We still adore the salad torcoloti, and I used her curry and garam masala blends as the starting point for my own, in the Spice Shop Mysteries. A few months later, I picked up Laurel’s Kitchen, the first cookbook to delve into the science and nutrition of vegetarian cooking. I still consult the tables of cooking times for grains and beans, and make the vegetarian chili often. Now I wish I’d sprung for the hardcover, but at the time, the 3.95 paperback was all I could manage! Actually, the first cookbook I ever bought was probably this copy of Betty Crocker’s Cookbook, my mother’s Christmas wish. There’s no inscription or, oddly, a publication date, but I’m guessing 1976. It lives in my kitchen now, and while I don’t use it much, it isn’t going anywhere for a long time. DARYL: I will never forget my first cookbook. I still have it. The Gourmet Cookbook, volume 1. I started cooking way back when - I mean way back. I sold pies around my neighborhood when was 7. Chocolate pudding pies with whipped creamed topping. I made dinners. I designed menus. I played "restaurant" with my sisters. In high school I became more serious about learning to cook. Not just the dishes my mother or father made - yes, my dad loved to make Crepe Suzettes and Sunday omelets and barbecue anything - but I wanted to make things that were "gourmet." With sauces and exotic flavors. I ordered The Gourmet Magazine and challenged myself to make one new recipe every month. When I realized I could "do" it, I decided to save my allowance and purchase the cookbook. It wasn't cheap! It is still a go-to cookbook for me. For so many items: biscuits, beef stew, roast beef. The book is oil-marked and milk-marked and pie filling-marked. I wasn't a neat cook. LOL But I don't think the book cares. It knows it has been well loved. I will forever be grateful to this cookbook for inspiring me to think bigger when it came to the kitchen. 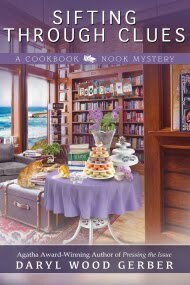 As for cookbooks in general - they are the reason I decided to write the Cookbook Nook Mysteries. When I stepped into a culinary bookstore and drank in the wondrous array of cookbooks at my fingertips, I fell in lust. That's the moment I knew I had to immerse myself in that world for one of my mysteries. SHEILA: My mother was a good plain cook--meat, starch and veg, plus dessert--so I grew up knowing the basics, like how to boil water. But my mother's idea of creative cooking was to add Vermouth to whatever meat dish she was making. 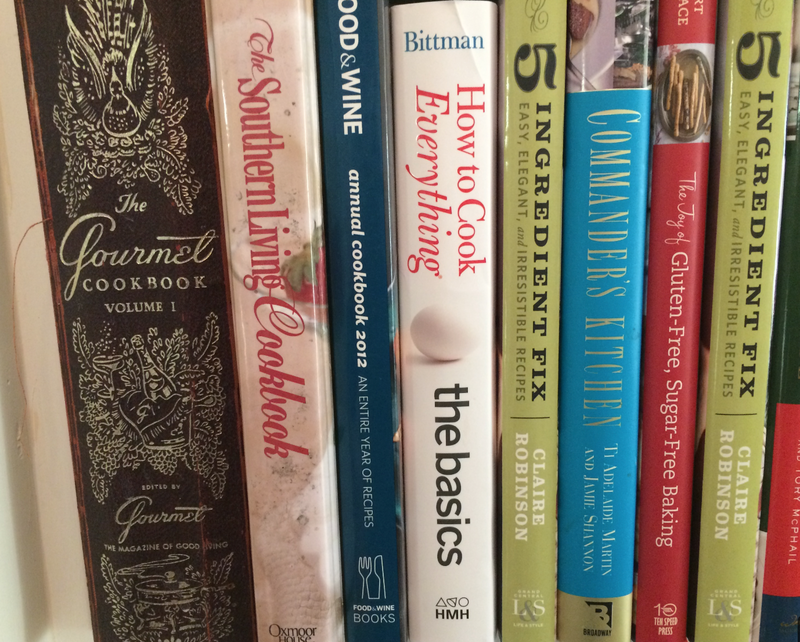 Her cookbook collection was kind of pitiful: it might have filled one bookshelf. I still have the copy of The Joy of Cooking that she must have gotten when she married. That was fine, because when I was a child, I was not a courageous eater. I had to separate each of the components of my dinner and consume each of them one at a time. 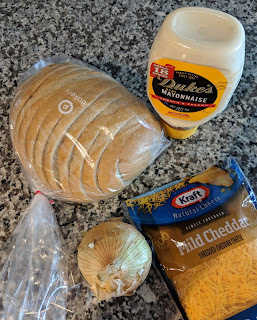 I hated onions and mushrooms, and I never knew what garlic was (although I was fond of artichokes and asparagus, mostly because they were fun to eat). My grandmother, who lived in Manhattan, sometimes took me and my younger sister to lunch in what must have been some nice restaurants, but I have no memories of what I ate there. 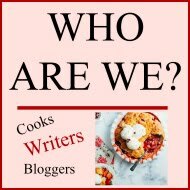 It wasn't until I discovered Julia Child and Mastering the Art of French Cooking (whose co-author Simone Beck is often forgotten) that I realized what "real" cooking could be like. It was the first cookbook I bought, as a gift to myself when I graduated from college and moved into a small apartment with a kitchen that could fit in a closet. I still say, if you have only one cookbook, get this one. The recipes may have French names, but they work. Julia had a sense of humor and would insert comments like, "this may look curdled, but don't worry--it will smooth out later." Her ingredient proportions were generous, she used herbs liberally, and when she said a dish would serve four or six people, she was right--and they were for normal people with healthy appetites. I still have that copy, and you can tell which are my favorite recipes by how greasy the pages are. When I married, my husband adopted some of the recipes as well, and still makes them. I even bought two copies (on sale) so I'd have back-up if the first one disintegrated into shreds. I don't know if I would have fallen in love with both cooking and eating if I hadn't found Julia Child. BTW, we named our daughter Julia. Okay, maybe not solely for The French Chef, but that first Julia was in the back of my mind. And now my daughter makes croissants for a chain of coffee shops, and is learning to bake bread in large quantities. So maybe it rubbed off. 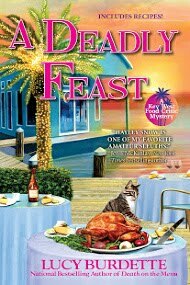 MARY JANE MAFFINI/VICTORIA ABBOTTt When I got married, I was able to make tuna fish sandwiches (white bread only, no crusts) and I could fry chicken, with some singeing. My mother-in-law was a wonderful cook and so was my mother so the time had come to pull up my socks. Things did not go well with the sock pulling. I quickly came to hate cooking but I did like to laugh and was good at that. Eventually I turned to Peg Bracken's popular (at the time) I Hate to Cook Book, a small and hilarious volume published in 1960. There were enough 'keepers' in those pages to save me from daily mortification. Bracken was like having a friend in the kitchen: she didn't mind a trick or two and she was always ready for a joke. 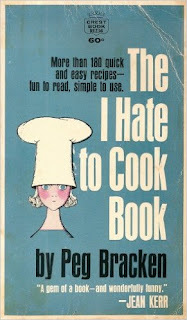 The I Hate to Cook Book is still going strong and was reissued for its 50th Anniversary: it even has a Facebook Page! After nearly fifty years, I still have my original I Hate to Cook and still make a few of the recipes. Unfortunately, in the process I began to like cooking and then was forced to invest in more ambitious and heavier cookbooks like Mastering the Art of French Cooking. I never did master the art of French cooking, but thanks to the wit of Peg Bracken I learned to find the fun in the kitchen. I did not name my daughter Peg, but you will notice I am still hanging around with another Peg who can be very funny. A few years back, I decided to include the battered little blue book in a box headed for Goodwill. But at the last minute, I realized there would never be a good reason to get rid of it. We keep our friends! PEG: Looks like Sheila and I both learned to cook from Julia Child and Simone Beck! I got a cookbook for a wedding present (1974) called Make It Now, Bake It Later. One recipe was for a casserole that included white bread and tiny canned shrimp. Enough said! KRISTA: Mary Jane, that's such a cute story. I never heard of that cookbook! 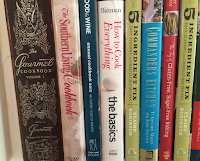 My first cookbooks were from a collection that my mom bought at the grocery store. They came out one at a time, and she bought one every month. She had all of Julia Child's books, but they didn't have many pictures, which was very important to me as a kid. I read cookbooks by photo, not by recipe. I looked for those old cookbooks in my mom's house the other day but I fear they're long gone so I don't even know who published them. LINDA: I love to laugh when I cook, Mary Jane. Helps get me through some dicey situations, so to speak. My first cookbook was a gift from my sister when I got married. She knows me so well! It's Craig Claiborne's Kitchen Basics. Up to this point, I hadn't cooked often at home and my roommate, when I'd moved out, was so good, I gladly left it up to her. So, having married another good cook, I felt the challenge to up my game. Craig helped me through it all...and still does. I can never remember equivalents when it comes to measurements, so I let Craig Claiborne handle that. 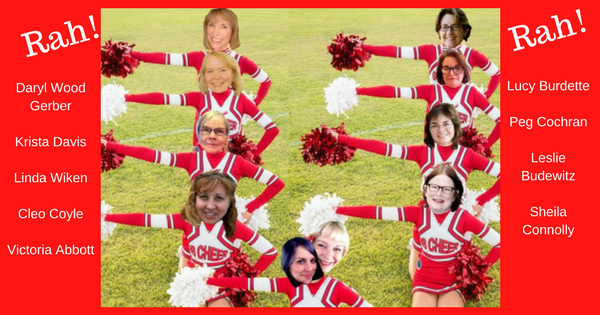 LUCY: Your stories are so much fun ladies! Sheila, my mother cooked like yours, only not well. She didn't like desserts either--her idea of a company dessert recipe was red grapes in sour cream! Cooking for 6 after working all day was a chore, and kids underfoot did not help. So I didn't learn much about cooking growing up. But I did inherit her copy of The Joy of Cooking, and I would still have it if a puppy hadn't eaten the cover off. And then some Florida roaches began to nibble the pages, and that book became history. I still love the cookbook, though, and use it as a starting point for lots of recipes. Thanks, Mom! CLEO: Like some of you out there, I come from a tradition of a little bit of this, a pinch of that--and a whole lot of garlic! My mom and her sister (who lived with us) were born in Italy and learned to cook from the women in their family. They had 3 x 5 cards with their handwritten notes, clipped items from newspapers, and tried out recipes printed on food packaging, but there were no cookbooks that I can recall. Dad grew his own vegetables and made his own wine. His parents were dirt poor and his mom (my grandmother) baked bread every morning for the family in an outdoor oven (again, no cookbooks). My own first memory of written recipes came from beautiful, glossy recipe cards that Mom received through the mail—probably a bonus with a magazine subscription. I remember my eyes growing wide at the incredibly beautiful cakes, cookies, pies, and other foods in that stack of cards. Somewhere in that moment, the seeds were sown to try my own hand at food photography and recipe writing. Written or unwritten, it's clear the wish for all our recipes remains the same—that we eat with joy! Do you remember your first cookbook? Is it still in your collection? 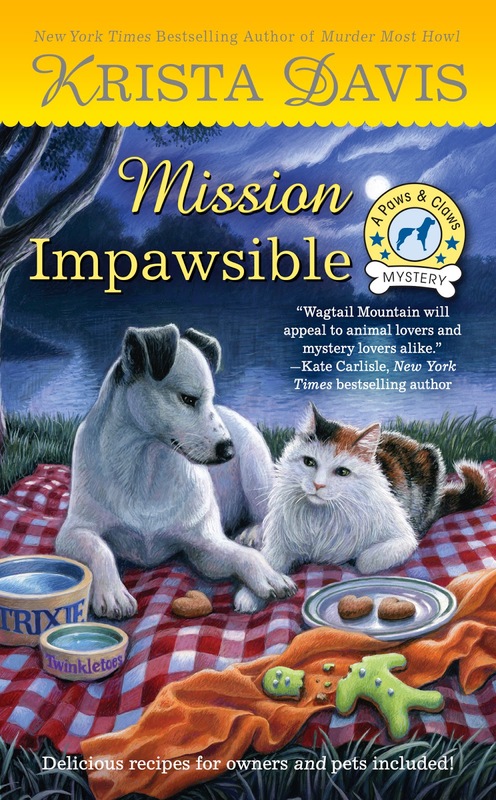 Krista's book, Mission Impawsible, launches tomorrow. 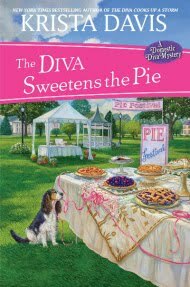 She's giving away a copy today! We hope everyone will join the conversation and leave comments. If you would like to enter the contest for Mission Impawsible, leave your email address in your comment, please. My mother used her extensive library of Better Homes & Gardens cookbooks. The BH&G New Cook Book (the classic red plaid one) is the first book I bought myself, and still the one I turn to when I need information. I have 3 copies of it -- a reprint of the 1953 edition, the 1965 edition my mother used, and the 2007 Celebrating the Promise Pink Plaid edition I bought myself. I find it interesting how the recipes and information in each edition are slightly different, and each one has slightly different things in it. My mother also gave me copies of the other BH&G books she used when I got married, so I can make my favorite dishes without calling her for all the recipes. Beyond those reference books, my favorite is an English cookbook that has done all the work converting classic American dishes for ingredients available in my new home country of Australia -- it's so nice to have the work done for me in regards to ingredients I can find to make deep-South and Tex-Mex favorites easily. I'm so glad other people collect multiples! I swear the early editions of Joy of Cooking and Fanny Farmer had recipes for cooking squirrel and maybe possum, but those kind of disappeared over time. Sheila, I'm pretty sure my Joy of Cooking has a recipe for cooking squirrel! I wonder what they taste like--chicken? Lynn, I've got two copies of that red & white BHG cookbook, two -- my mother's copy from 1948 and one I bought in the early 1980s. That American-to-Australian conversion cookbook sounds like a real find! My mother has an amazing cookbook that she carries with her when she comes to visit me. My grandmother, who I cook like, never used a book. I love that she bring it with her, Tonya! That's so sweet. My grandmothers were like Cleo's, too. And my grandfather made his own wine. I never saw either of them look at a cookbook--they would make homemade ravioli, fabulous sauces but never desserts--always Italian pastries from the bakery. My other grandmother showed me how to make some things but she never measured--it was a "handful" of flour or a "pinch" of salt! Christine and Peg - It's interesting how cooking customs change through the years--and even the attitudes about cooking your own meals or growing your own vegetables. It's very popular (even hip) now to have a garden of herbs and veg. In my childhood, it was the mark of a family hedging its bets against bad times. My dad's family came through the Great Depression with great skills in the grow-your-own department, and I miss Dad's big, beautiful tomatoes every summer! My first cookbook was my grandmothers's and she gave it to me because she never used it. Better Homes and Gardens New Cookbook, with the red and white checkerboard cover, pages on meal planning and how to properly set a table. 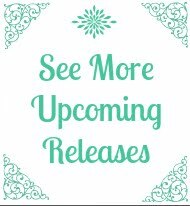 There isn't a date but guessing from the picnic picture of a red and white plaid thermos and the mom in a shirtwaist dress I'm guessing late 50's early 60's. And I still use it for some things. Even though I just pull it out open it to the page and never look at it again. After all My busia taught me to cook, a little bit of this a little bit of that and stir till it looks right. That's wonderful, Suzanne. Even if she didn't use it, it must remind you of her each time you look at it. Cleo, great photo! Was your mother a war bride? Leslie - Thank you, I love that photo of my dad and his mother, my grandmother Grazia (Grace) Cerasoli Alfonsi. 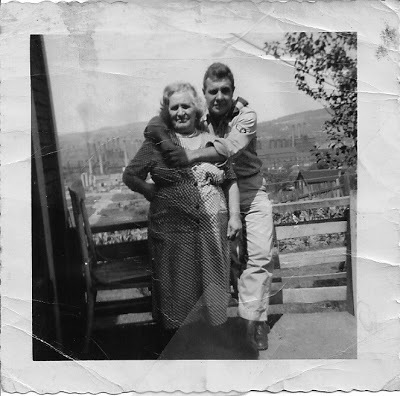 My dad (Tony) met my mom (Rose) at a dance in the Pittsburgh (PA) area in the 1950s. My mother came through Ellis Island with her family when she was still very young. My (Yankee) grandmother never learned to cook at all, beyond fudge and meatloaf, and I'm not sure she owned a cookbook--although when she was working for Lipton in New York she hung out with various foodies like Craig Claiborne. The Irish side? At least one of my Irish great-aunts was a cook for a family in Connecticut, and I have her short notes. Most striking is that every recipe seems to include sugar, even the savory ones. I've gone to the other extreme--I went to see Julia Child do a cooking demonstration in San Francisco (and I still have the recipe handout! ), and I was in a small restaurant in Berkeley when James Beard walked in. He was an unmistakable figure, and immediately recognizable (but I'd "discovered" the restaurant before him!). My mother had his cookbook on barbecue grilling, and I recently picked up a used copy. Great pictures! I love the Better Homes And Garden cookbook. My parents gave me a copy when I moved to Mississippi. I have my mom's older version also. It had recipes that I used that are not in the later versions. I don't cook much anymore as it is just me. My first cookbook was a book of cookie recipes. I don't have it anymore but I used to make a no bake chocolate rum ball recipe from it. One of my all-time favorite cookie cookbooks was one I bought in 1972, and I still use it. It even has its price sticker on it: I paid $2.95. Great sugar cookie recipe. That does sound delicious, Sandy! I love rum balls.